1) The Tactics / Techniques are poorly designed without a thorough understanding and respect of the physiological and psychological effects that the stress of life/death assaults incur. 2) The Tactics / Techniques are based too much on 'Fine' and 'Complex-Motor Skills' that deteriorate under significant stress. 3) The Tactics / Techniques are too complicated and learning would take too long (years and years) for them to be remembered under stress and more importantly... to be useful right now! 4) The Training itself doesn't replicate the reality of a Weapon Assault. 5) The actual attack is too static and doesn't look and feel like the real way that Bad Guy's attacks with a weapon. 6) The Bad Guy role in training is too compliant. The behaviour of the Bad Guy lacks intent, is too static and doesn't move and react the way a real Bad Guy does. 7) Does your SPORT Combative toolbox transfer to a STREET Weapon Scenario? 1) Use Tactics / Techniques that are designed to maintain their effectiveness under the effects of a real weapon assault. 2) Use your body/mind's natural and instinctive reflex's and responses as your starting point, to survive the initial assault. Go with what your Survival System wants to do; not against it! Millions of years of evolution has made our Survival reflexes highly effective. It makes sense to use this resource and design our Tactics from it! 3) Use Tactics / Techniques that are based on 'Gross-Motor Skills' that thrive under the effects of Adrenaline. 'Gross- Motor Skills' will be there for you always, (they are the last part of your skill-set to deteriorate!). Where as 'Fine/Complex-Motor Skills' work only under certain low-stress situations and require thousands of repetitions via hours of training to be effective. Even then they still may breakdown during high stress deadly force encounters. Think of the times you will see a Professional Boxer throw Haymakers, rather than a Complex Combo, at a pre-fight weigh-in altercation! 4) Training should replicate the reality of a weapon assault as accurately as possible... this includes the general behaviour of the Bad Guy such as the pre-fight stage, but also the actual type of attacks (that are statistically most common) and the dynamic way in which they are often used. 5) Training should eventually Pressure Test the skills learnt, in a safe but realistic way as possible. 6) The Bad Guy role in training is so important. Replicate; don't Simulate! The Bad Guy should be reacting naturally to whatever the Good Guy is trying to do - natural instinctive behaviour, such as trying to regain control of the weapon, if the Good Guy grabs it! All too often, you will see a Bad Guy standing still after a single attack and then be totally compliant to whatever the Good Guy is doing! Have a search of You Tube and see how REAL attacks happen! Observe how they are far more chaotic and dynamic than most of what you actually see in training. The Bad Guy doesn't care whether you have a Black Belt or whether you are a National Champion or not! As a Self Defence Coach, I am continually researching, analysing, training, pressure-testing all types of methods and tactics to teach others. That is my responsibility - to ensure that what I teach, actually works to the best of my knowledge in order to keep people safe! I hope you will also embrace this responsibility for you and your families safety. 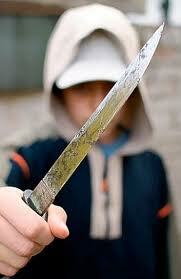 Adopt a healthy look at your Self Defence training by asking the correct questions, to get the right answers. Avoid blindly following a system of training, just because it's packaged to look cool or because the teacher is a 15th Dan Black Belt. Do your research and make sure you get to the best training possible. Keep an open mind and never stop learning and exploring! No single person has the answer! Seek your own truth! This weeks Personal Defence Readiness™ Class focused on giving students a healthy appreciation on how, what we hold in our hands, effects the way we reflexively flinch in an ambush moment, of a street confrontation. Although many students of S.P.E.A.R. already have discussed these effects, it's always good to have a physical experience of just how tactics are effected, in real time; force-on-force. There is a scientific principal referred to as the 'Crossed Extensor Reflex'. Firstly, if we are surprised, think sudden, unexpected street attack, our survival system causes us to flinch, using a Withdrawal Reflex, which aims to protect the brain principally, and often negates, deflects and reduces damage from the attack. This Reflex is 'Pure Physiology' as it bypasses the Cognitive brain, it's the fastest reaction we have. Remember a time you touched a hot cooker, your hand withdrew without any thought process, it was a pure instinctive behaviour, that was effective due to it's speed, which was due to not having to waste time thinking or making decisions. The thought process happened after, not during. However, it gets interesting if you are holding an object in your hands when you flinch. Normally the flinch aims to protect your head (or other targeted area) by use of the forearms and hands. If though you flinch whist holding say a pint of beer (worth protecting right! ), research has found how the hand grips the object even tighter and keeps the object in the same relative position. We think that we might drop the object... but most of the time, we don't! Have a look at the photo below, where a baseball bat breaks and flies into the crowd! 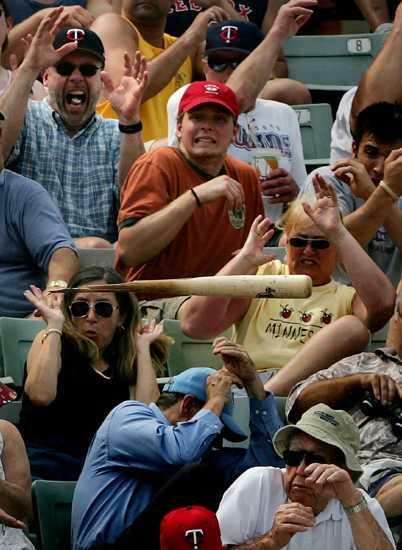 Everyone is flinching but take a look at the people holding objects. Why this happens we can only speculate. 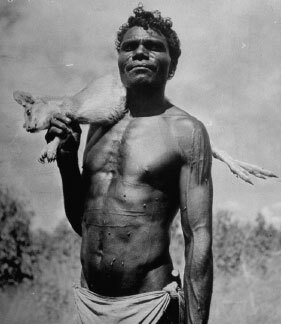 Perhaps it's a protective reaction that's evolved over thousands of years as hunter-gatherers, so that if we are startled when carrying a baby, we hold on to it, whilst the other arm tries to push away the danger. Normally, the only time we will drop a held object, will be if you have enough time to allow a cognitive thought process to happen, which if it's a true ambush, is very unlikely! Tony Blauer and his S.P.E.A.R. System™ research has greatly influenced tactics in many professions, that have to deal with frontline violence to staff, such as Police, Nurses, Care Workers, Security Operators, etc. Often staff have to hold objects as part of their job, whether it be a clipboard, a torch, a pair of handcuffs, so you can imagine how taking on board this research into their training has greatly improved their safety. In short, if somethings pings on your threat assessment radar, get stuff out of your hands ASAP! In the photos below, you can see Max and Kevin at our PDR weekly class, doing some drills that explore different evolutions of the startle-flinch, whilst holding a bottle. The flinch expresses differently each time due to various factors. These factors include the level of the Good Guy's awareness at any given time, but also on the level of the Bad Guy's speed, aggression and how close they are to the Good Guy. It was great to see the guys leaving their ego at the door, and allowing themselves to simply 'experience' the Crossed Extensor Reflex effects naturally and organically when flinching from a surprise attack. Training 'Off-Balance - On Purpose', allows for greater 'relative calm' should you ever experience this on the Street, as well as giving them a deeper level of understanding of the cross extensor reflex and its impact on combative tactics. 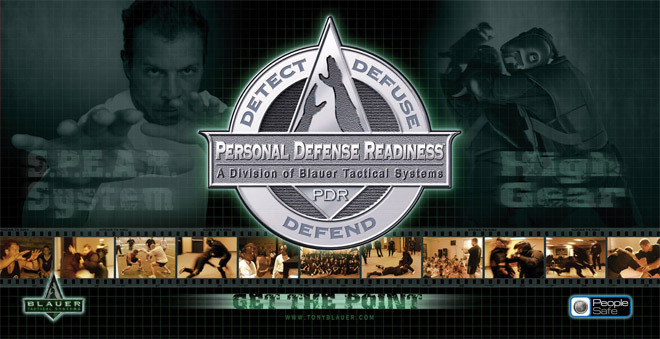 At this week's Personal Defence Readiness™ Class at Safe Space Gym, we brainstormed some of the cerebral self defence concepts and principals in the PDR/S.P.E.A.R. System™ on managing fear. Our objective was not to go too deeply into any one of the principals (save that for another time), but to create and re-view a bigger picture mind-map of them within the system. It certainly is one of the main reasons a lot of Self Defence and Martial Arts Instructors choose to get trained with Coach Tony Blauer of Blauer Tactical Systems. It fills that huge missing gap in conventional training... the emotional and psychological side of dealing with a confrontation. We pulled out concepts that can be used with a friend over a cup of coffee to principals covered in the physical drills and force-on-force scenario replications..
You can see in the whiteboard photo, that there are quite a few blocks within the system. The beauty of these is that, like lego blocks, they connect and build upon each other in many different ways. It is a wholistic system that is three-dimensional. Not linear! As a coach, it gives a lot of freedom to get creative when coaching an individual or group, based on their training needs! We can combine the ingredients in a particular way to move a student towards specific experiences, goals or results. It keeps training fresh, fluid and appropriate. Fear is one of those subjects that seldom gets covered in any depth, which is strange considering that real violence is completely surrounded it. The powerful hormones of a highly aroused primitive state can either help us or it can hinder us, depending on our relationship to it. Training needs to blend Fear Management into the physical aspect and also as a performance enhancement tool, used before, during or after any challenges in life. Being that fear is such a fundamental part of our everyday lives, these tools can be very useful to us in managing day to day life... a job interview, preparing for an exam, a family dis-agreement, a change in your career path, becoming a parent, and so on. Personally I have used these tools in my own life and when coaching others, from mentoring a lady who has a phobia of flying on aeroplanes... to helping prepare a client for giving birth... to de-briefing a person involved in a knife attack. Each one of these blocks can open a door to positive changes in a persons behaviour, that ultimately can and does save lives or at least enhance the quality of their everyday lives. Fear is such a powerful driver in life. What I personally find fascinating is the depth of each concept, how you can continuously explore each concept... the rabbit hole runs deep. The physical drills within the SPEAR System™ manages to weave many of these principals into them, giving an experience that is truly three-dimensional in training and therefore better and more realistically preparing a person for any degree of confrontation. Here is a video clip of a great real-life news story of someone using their strength and fitness to save another person's life. Timothy Kirkland was making repairs underneath his minivan, , when the jack collapsed, trapping and crushing him. 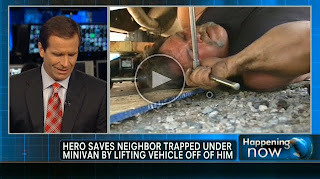 His son and wife were trying desperately to lift the minivan off but without success! Time was critical. Enter Mike Treciak! Mike Treciak sprinted half a block and proceeded to lift the minivan off Timothy. His son managed to pull him out whilst Mike held the minivan up, as Timothy was immobilised from the crushing injuries when the minivan fell on top of him. That was a fantastic demonstration of fitness right there! Running plus Deadlifts is a combo that is used and will be recognised by CrossFitters worldwide! I wonder why? It is also an example of great mental attitude, will power and quick thinking. Mike reacted very quickly when he realised Timothy was in serious trouble. He also did not manage to lift the minivan up on the first attempt! Anyone who's tried Deadlifting for a one-rep max lift, will know just how difficult it is to succeed on that lift a second time, when failed on the first attempt! Mike managed to lift the minivan successfully and literally saved the man's life!! Way to go! This is what having a good fitness capacity and mental fortitude is all about! As CrossFit founder, Greg Glassman often quotes: " Preparing for the unknown and unknowable!". BORN TO BE ACTIVE; SITTING KILLS! In this week's Personal Defence Readiness™ Class, we explored a Scenario which involved being seated on a train next to someone. When the Good Guy (GG) accidentally spills his drink, the BG gets upset and then escalates into violence. Due to the position and environment, the Bad Guy (BG) used an Elbow Strike as his Primary Initiation Attack. The GG's task was to Convert his Startle-Flinch Response into something combative (S.P.E.A.R. System™), think Stun & Run, which allows him time to move away and escape the BG. This week the training was done without any protective gear, so we could analyse and explore the BG's pre-contact cues and the use of Non-Violent Postures™. Next week... we'll get everyone into High Gear™ so that we can get the reps done in real speed, real time! After a discussion at last night's class, I thought I would post you all a couple of links, to some very cool people. They will undoubtedly help you become better warrior athletes! The most important aspect of health/fitness. It changes you from the inside-out! They have a Blog which I recommend you follow. Improve your Mobility. Stretch. Relax. Massage. Injury Prevention. Rehab. He posts a daily 4-5 min video on his Blog, which gives instruction for a 10 min Mobility Workout. This varies from day to day and involves stretching, using foam rollers /balls to unglue tension, and so on. It will improve the way you MOVE! It is relatively new Blog and started last year. He's posted everyday since. I would go find and watch the first few videos to get an overall idea of the concept and to understand WHY it's so important. We do some CrossFit at class. We also hope that you do some in your own time too! Fitness is fundamental. Use it or lose it! Private lessons or classes at CrossFit Hove (Davigdor Road). Benefit from being coached in the movements and have workouts scaled to your own level.